Welcome to Vietnam’s nancial hub: Saigon (Ho Chi Minh City). Transfer to the hotel and have a good rest. After breakfast, drive northwest to the Cu Chi tunnels. This tunnel complex was dug in 1948 for the guerrillas to hide from French air and ground sweeps. Have lunch at local restaurant. In the afternoon, participate in a guided tour in Ho Chi Minh City,which includes Reunification Palace, the neo-romanesque Notre Dame Cathedral, the Central Post Office with its French style architecture, City Hall, and the magnificent Saigon Opera House.Then we will visit Ben Thanh Market where an incredible display of fresh produce is oered. Overnight in Ho Chi Minh City. In the evening, enjoy dinner cruise on Saigon River. Have a breakfast at hotel, we travel from Saigon to My Tho. Cruising a boat trip along Mekong river and around fishing village and islands for sightseeing. Crossing Mekong river, keeping on taking a boat trip along a small canal, named Vam Xep to see daily life of local inhabitants in Ben Tre province (called coconut village), visiting Quoi An tourist spot for bee farm and handicraft workshop to enjoy some honey tea and see how people make things from coconut wood. Taking horse carts along country road to visit fruit orchards, enjoy seasonal tropical fruits and listen to traditional music by local inhabitants. Taking small sampans along small canal to come back the big boat, leaving boat for coconut candy workshop and tasting this speciality in coconut village. Coming back My Tho by boat. Get transfer back to hotel. Today we take the morning flight to Danang. Upon arrival, pick up and transfer to the restaurant for lunch. In the afternoon, you will take Hoi An sightseeing of Japanese covered bridge, Handicraft workshops, Tan Ky old house, Fujian assembly hall and the 15th century Chuc Thanh Pagoda. In the evening, you may take the optional Relaxing Dinner Cruise on Thu Bon River. (£40/pp). After breakfast at hotel, our local tour guide will pick you up and drive to visit My Son sanctuary, an ancient religion center of the Cham people in the past, 40km to the South West of Hoi An town, another World’s Cultural Heritage. Return to Hoian in time for lunch then enjoy a free afternoon, for shopping, exploring or beach side relaxation. After breakfast at hotel,check out and transfer to Hue.On the way you will visit the fascinating Cham Museum and the Marble Mountains. We will cross Hai Van Pass where you will have magnicent view of the East sea.Check-in hotel on arrival in Hue. In the afternoon, you will take a boat trip on Perfume River to visit Thien Mu pagoda and Ming Mang Emperor’s mausoleum. In the evening, You may take the optional royal dinner with the live traditional music dance performance (£40/pp). After breakfast at hotel, you will visit the Imperial Citadel, Flag Tower, Noon Gate, Nine Dynasty Urns, Nine Holy Cannons, Thai Hoa Palace. Have lunch at local restaurant. Next,we visit An Hien House. This house is an excellent example of traditional Vietnamese architecture. Massive pillars support a large tiled roof, with the family altar in the middle. Free shopping in Dong Ba market. Next, transfer to the airport to catch the departure flight to Hanoi. Once arrival, the local guide meets up at airport and transfer to hotel. After breakfast at hotel, drive to the historic complex of Ba Dinh. Visit Ba Dinh Square, Ho Chi Minh Mausoleum and continue to the One Pillar Pagoda, the must-see monument in Hanoi, Tran Quoc Pagoda, Quan Thanh Temple. Visit Temple of Literature - The first Imperial school in Vietnam built in 1070 during the dynasty of King Ly. Have lunch at local restaurant. This afternoon visit a complex of the Hoan Kiem Lake, Ngoc Son Temple (Jade mountain Temple), But Tower (Pen - shaped tower), Dai Nghien (Ink Stand), the Red painted wooden The Huc bridge....Have a cycle (pedicab) trip around with 36 streets of Hanoi old quarter. Enjoy the special Vietnam traditional Water Puppet show. After breakfast, you will take a morning depart for Halong bay, we go through the scenic countryside. The wondrous Halong bay is truly one of Vietnam’s most impressive scenic sights. Heading out of the town we embark on a boat for an exploration of the legendary Halong bay. This exciting five hour cruise will provide us a fantastic view of the picturesque scenery blending with the sky and some 3,000 limestone islands rising amazingly from the clear and emerald water. The limestone karsts formations are littered with beaches, grottoes and beautiful caves. Along the way we will anchor for a leisurely swim in a secluded cove and an enjoyable visit to one of the many hidden grottoes beneath towering cliffs. Stay overnight on board. Waking up and having breakfast served on-board. Continue cruising around the bay. Take sampan to visit Luon Cave and come back to the boat. Having brunch before disembarking and van will pick you up at the pier. Then transfer back to hotel in Hanoi. Check in and free at leisure. Free until transfer to the airport to catch the departure flight to Siem Reap. Upon arrival, pick up and transfer to hotel. Today you will have dinner at local restaurant with traditional Apsara dance show. In the morning, we will get up early morning and take tuk-tuk to catch the best moment to see Angkor Wat Temple, the most wonderful remains of a disappeared civilization which between the 8th and 13th century, built the splendid Temple of Angkor, partially annihilated afterwards by invasion and hidden for centuries by forest. 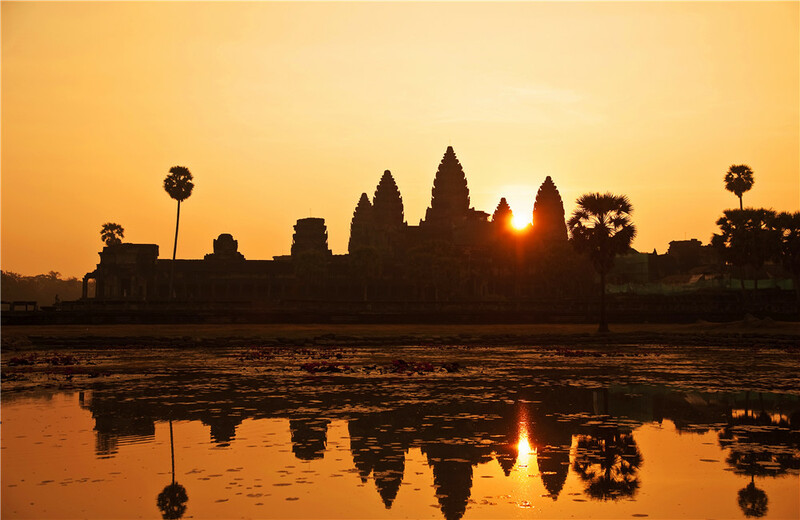 Angkor is the big attraction not just for Cambodia but for all over the world. This temple, dedicated to Vishnu, was constructed at the beginning of the twelfth century. It is remarkable for its powerful architecture and for the richness of its sculptures. Dawn is one of the most beautiful and haunting times to visit the temples, whose ancient sandstone blocks are gilded gold by the early morning rays. Return to the hotel for breakfast then free at leisure until transfer to restaurant for your lunch. Afternoon, we visit the jungle-entwined temple, Ta Prohm. 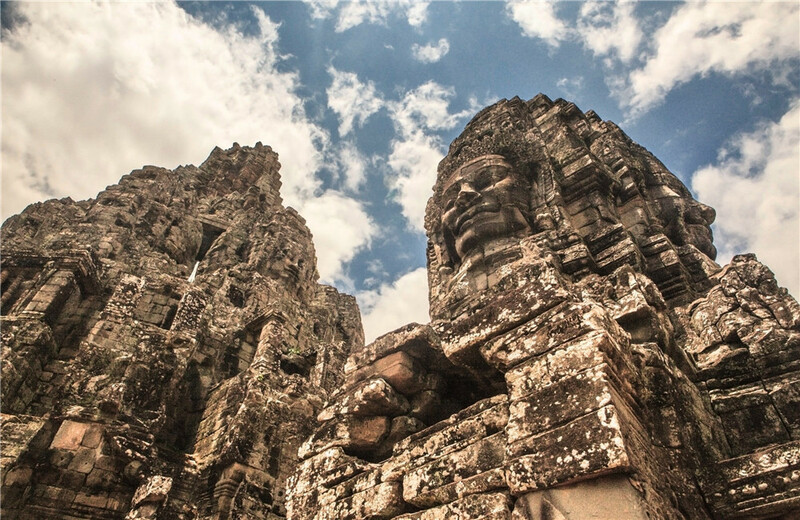 Then, we will catch up our discovery to Angkor Thom (the Great City) including the Southern Gate, Bayon temple, enjoy the romantic sunset at Phnom Bakeng hill top or Pre Rup temple. Back to the town and enjoy a well-earned hour foot massage. In the evening, enjoy farewell dinner at restaurant. Overnight in Siem Reap. After breakfast, we drive out of town to the rural village of Pour Krom and walk through this lovely village to see local life. We enjoy an ox cart ride before transfer to Chong Knies village to take a traditional wood- en boat for a ride on the Tonle Sap Lake, the “Great Lake” of Cambodia, one of the largest in Asia, where you can find schools, restaurants, and hospitals and much more on the great lake of Tonle Sap. Next, visit Les Artisans D’ Angkor shopping. Back to the town to explore the Psar Chass, also known as the “Old Market” .Free until transfer to the airport to take your departure flight to Shanghai. Shanghai is the vibrant metropolis and commercial center of China. Today we will visit the Shanghai Museum and indulge in ancient Chinese art, furniture, and jade. Then we will visit Shanghai Old City God Temple area, a busy shopping centre where you may find souvenirs and delicious local food. Enjoy some free time here. In the afternoon you will walk along the famous Bund, a mile-long stretch along the Huangpu River. Lined by the colonial architectures of European design, this area is the best place to capture the western influences of the old days. At night, you may enjoy an optional “Huangpu River Night Cruise” and get a glimpse of the dazzling and charming night view of Shanghai at your own expense (£40/pp). Breakfast at the hotel. Check out and transfer to the airport. Fly back home or to your next destination! Tour prices are subject to change without prior notice. Fly to Luang Prabang in the afternoon. You are picked up on arrival and transfer to hotel for check-in. Overnight at hotel in Luang Prabang. Luang Prabang is an enchanting town filled with historic temples and colonial style buildings. The entire town was declared a UNESCO World Heritage Site in 1995. Start the day at Wat Visoun (Wat Wisunalat). The oldest living temple in Luang Prabang, Wat Visoun dates back to 1513 and contains a collection of antique wooden Buddhas. Visit the nearby Wat Aham before continuing to Wat Xieng Thong, the crowning jewel of all the monasteries and temples in the city. From there, stroll down the main street of Luang Prabang, stopping at some of the many temples that line its sides, including Wat Sibounheuang, Wat Si Moungkhoun, Wat Sop and Wat Sene. Continue to the National Museum (Royal Palace), a modest but graceful building which combines traditional Lao and French beauxarts motifs. Afterwards, visit Wat Mai. Visit Mount Phousi for sunset, climb the hillside stairs to the small temples atop Phou Si, the 100m high hill which sits in the middle of the town, offering beautiful views over the temples and river. Excursion by boat to the Pak Ou Caves. Travel down the Mekong River to the steep limestone cliffs overlooking the Mekong and Nam Ou rivers, home to the Pak Ou Caves. These extraordinary caves are filled with Bud-dha images, of every style and material imaginable. On the return journey, stop at Ban Xang Hai, a local village famous for the production of lao lao, the local rice wine whisky. Visit Ban Xang Khong, a village near Luang Pra-bang well known for its traditional handwoven cotton and silk, as well as production of the local sa (mulberry) paper. This evening, participate in an interactive Lao cooking class where you can taste Lao food culture for yourself. This morning is free at leisure. Then fly to Shanghai via Bangkok. Visit Shanghai on Day 17 and fly back home on Day 18.